Brighton Ford : Piper, The Brighton Ford Pet Of The Week, Came All The Way From Virginia To Meet You! 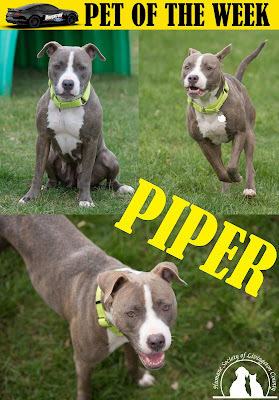 Piper, The Brighton Ford Pet Of The Week, Came All The Way From Virginia To Meet You! I’m a beautiful 1-year-old grey and tan brindle Pit Bull mix! I’m spayed, micro-chipped, and up to date on vaccines! I was transferred here from Virginia to find my new family! I’m very friendly and sweet and I love to play! I’m working on my leash walking! I can jump fences so my new family will need a very secure enclosed yard! No cats for me please but I could possibly live in a home with another dog but that would be on a case by case basis! I’m looking for my new family to love…do you think it could be yours?